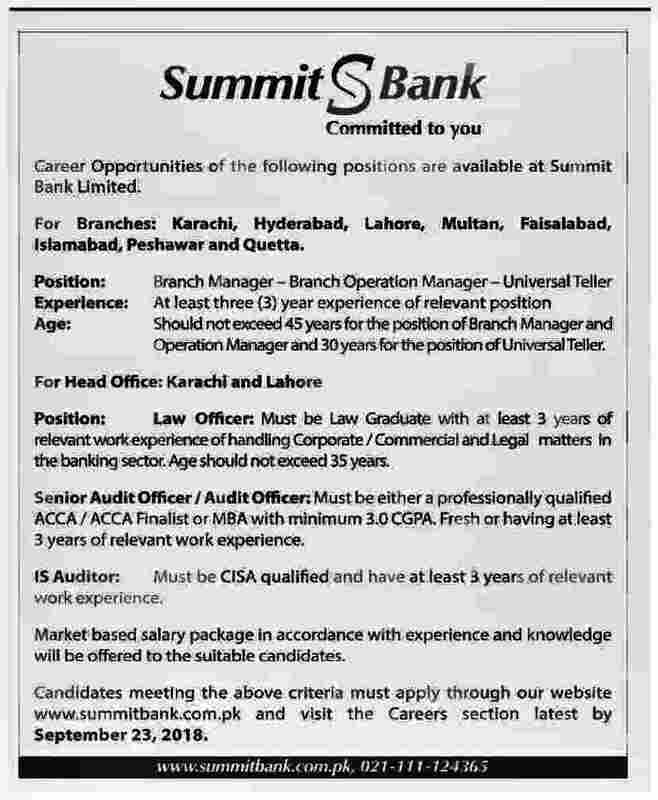 Get Summit Bank Jobs September 2018: Summit Bank is welcoming applications from freshers and specialists for the posts of Tellers, Branch Managers, Law, Audit & Other vacancies across Pakistan in major towns and cities including Islamabad, Lahore, Karachi, Peshawar, Quetta & Other Cities. Necessary certification from the recognized institution, appropriate work experience and age limitation requirement are as following. Qualified candidates ought to connect with the post in prescribed way. Incomplete, belated, hand written submissions/applications won’t be entertained. Only candidates that are shortlisted be needed written test/interview. Begin to see the notification below to see vacancies/positions available, eligibility requirements and other needs. Eligible candidates must submit applications on or before 23rd 2018 September. Qualifications & Age Limit: See job notification below for relevant experience, qualification & age limit information.